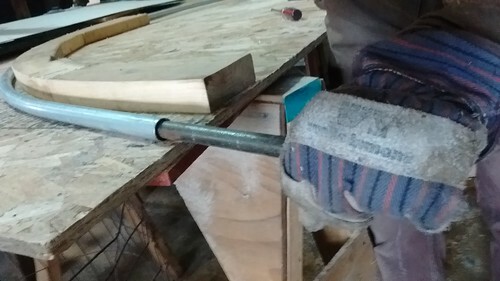 If you’ve spent much time online looking at sustainable ag and/or garden-y type stuff then you’ve probably ventured upon a myriad of uses for bent-up pieces of metal tubing. Hoops they call them. Hoops are made into all kinds of fun stuff like row covers, high tunnels, livestock shelters and the like. You can find some commercially-made hoop benders out there, but a hoop bender is pretty simple. For being so simple, there should be a plethora of how-to’s out there on the internet showing how to make one, right? Nope. So here you go: make yourself a hoop bender. Figure out what size hoop you need. In my case I wanted a hoop with an 8′ diameter. 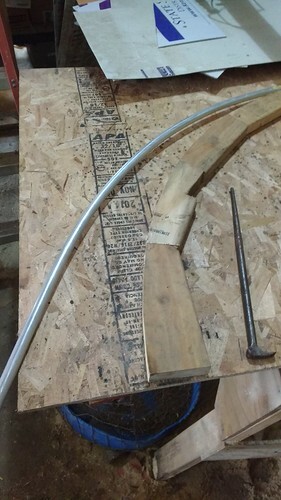 You may assume that you can build a hoop bender to a nice 4′ radius and that the resulting hoops will be 8′ diameter. But you would be wrong. How do I know? Well, just trust me, it won’t turn out like that. It will make a dandy 10′ diameter hoop though. 38.5″ seems like it ought to be just the ticket for a 8′ hoop. Now, with all the math out of the way, get a nice sheet of something. Maybe OSB, it’s cheap and strong. 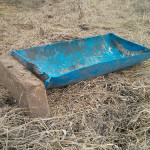 Oh, and while you’re at it round up some scraps of 2″ scrap lumber. I used a bunch of 2×6 scraps. 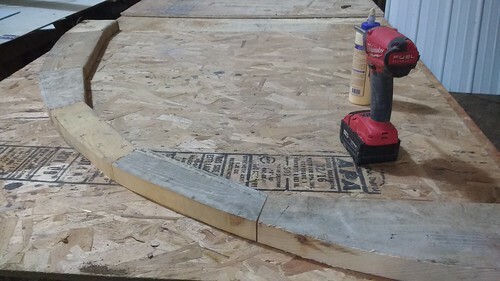 Trace out an arc of the proscribed diameter (38.5″ in our case) on a half sheet of OSB, and start laying out your scraps of 2″ lumber to cover up said arc. Draw another arc of the appropriate size on top of the 2″ lumber and start cutting away the excess. Place all the little 2″ peices back on the OSB in the right order and get to gluing and screwing them down. My operating assumption is that glue and screws should be strong enough for bending 1.375″ chain-link top rail. 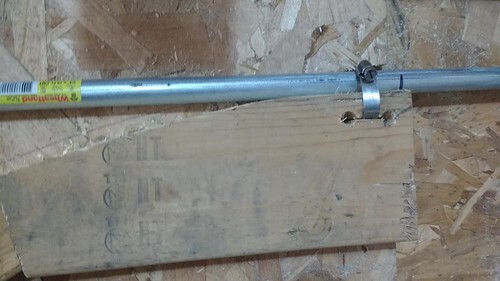 It does a bang-up job bending 3/4″ EMT conduit. The last order of business is having something on one end to hold the tube as it’s bent. I opted to cut a small slot near the end and thread a large hose clamp through. Good enough, I’ll double it up later if it looks like the top-rail might need more to hold it. Secure your brand-new hoop bender to the work surface of your choosing (clamps or screws ought to do the trick) and get bending.